I attended the annual SHRM conference for 16 years in a row. In 2009, our budget was tight at ASHA and I didn't go. The next couple of years, I identified other learning opportunities, but this year I found myself missing SHRM, so here I am at my 17th annual SHRM conference in Atlanta. The conference is pretty much the same as I remember -- lots of interesting sessions to choose from, ridiculously long lines for the restroom, even more ridiculously long lines to get a cup of coffee, and ten minutes in the exhibit hall sends me into sensory overload. The tools are a little better though. 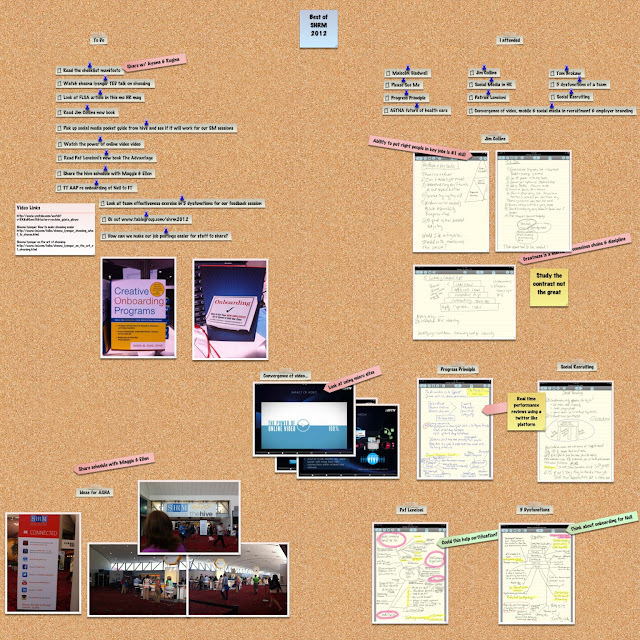 I have my iPad and use Notetaker HD to take notes during the sessions. When someone mentions a book I'm interested in, I have it downloaded to my Kindle in less than a minute. (Well, not really less than a minute -- my 3G is about as fast as dial up in the convention center.) Sorry Jenny and Vince -- I do still appreciate the SHRM Store. And, of course, I love connecting with my SHRM friends. SHRM is really pushing social media and Twitter, but I haven't been able to get the #SHRM12 tweets to load when I'm in the convention center at all. Of course, I don't blame SHRM for the network being overwhelmed with traffic. Guess that just shows you what avid social media users SHRM folks are. The Hive was a fun idea. The Hive was set up to help attendees receive "actionable guidance from leading social experts, your peers and SHRM about how you can leverage social media to engage employees, attract talent and build your brand." I'll be taking that idea back to ASHA. Maybe something similar would be appreciated by our members. I've used Corkulous to compile my "Best of SHRM12 Notes." It's been a fun tool to capture what I want to do and share when I get back to the office. ASHA's annual conference will be in Atlanta this year too, so I'm all primed and ready to work to make the experience as good for our members as it was for me.